There are few joys as nostalgic and pure as packing up a wicker basket full of treats and hitting the grass, picnic style. The only thing missing from this leisurely trifecta of food, sunshine and horizontal relaxation was, of course, art. Until now. Swiss artists and twin brothers Frank and Patrik Riklin have revolutionized the potential of the almighty lunch break with Bignik, which is basically a really, really big picnic. 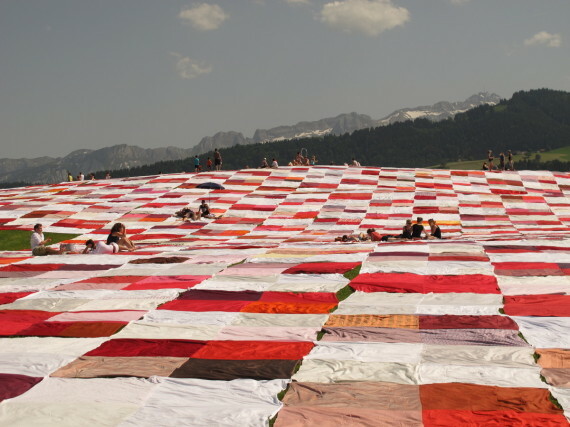 The artist duo created the massive installation in Stein, Switzerland, covering a public space with a participatory work of art massive, beautiful blanket. The super-sized feat, 160,000 feet of comfy, ant-resistant goodness, was sewn together from recycled towels, curtains, sheets and tablecloths, all donated by the local community. The setting gave way to a massive family-friendly art feast, with 1,500 visitors bringing sunscreen and snacks to the novel art event. "Art has to have a clear function," Patrik expressed. "It should be experienced amidst life and not be confined to art galleries and museums!" He took the words right out of our mouths. We'd potentially add that it should also be experienced amidst peanut butter and jelly sandwiches and potato chips, whenever possible. This year marked the second ever install of the glorious Bignik, and only 4% of the Riklin brothers' full vision. That's right, by 2040 they hope to expand their blanket to an area comparable to 100 football fields. Just think of all the potato salad. If more museums took a hint from sand boxes, we imagine they'd be far better off for it.